The festive season is all about traditions, old and new. Becoming a parent means that you get to create customs for your new family and I went about this quite consciously when we had our first child. 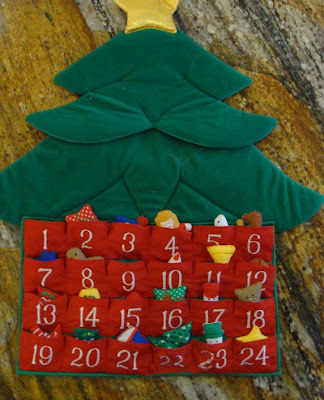 One thing I bought was a re-usable cloth Advent calendar in the form of a Christmas tree, which I thought would make a good leading-up-to-Christmas tradition for us to have, many years into the future. 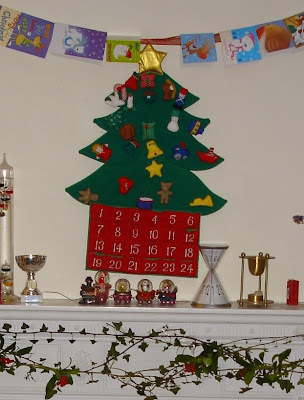 This is how the calendar looked at Christmas 2005. You can see that there are small cloth decorations for each of the days before Christmas. 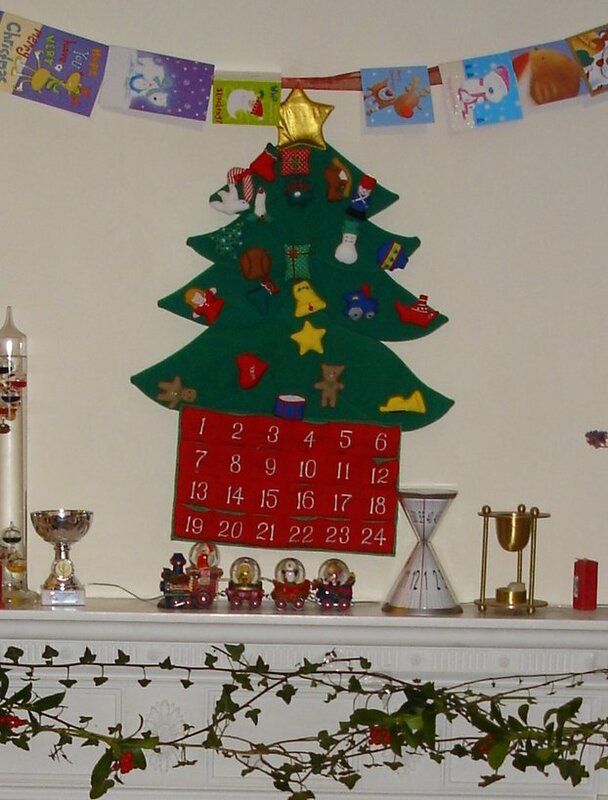 We've used it for ten years now and it is as popular with the children as I'd hoped it would be. I was consequently horrified this morning to find that it had been well and truly nibbled by a mouse. 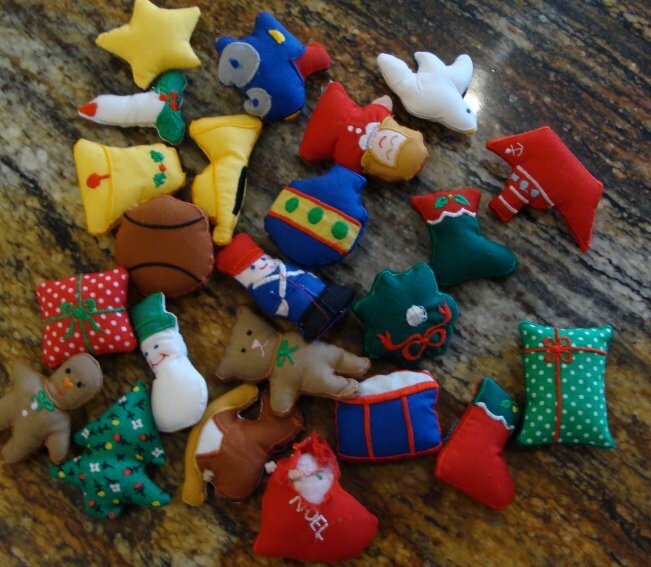 The middle section of the tree was ruined and the lower part of the numbered pouches that hold the ornaments had been badly damaged, with the figures 22 and 23 missing. Now needlework is not something I can claim to be any good at. My mum had to invent a dentist's appointment for me when I was fourteen so that I could avoid the last dressmaking lesson of the year. I'd managed to completely ruin the blouse I was supposed to be making and couldn't face admitting it in front of the rest of the class. I've never enjoyed sewing since, so the prospect of making good this ruined tree did not appeal. 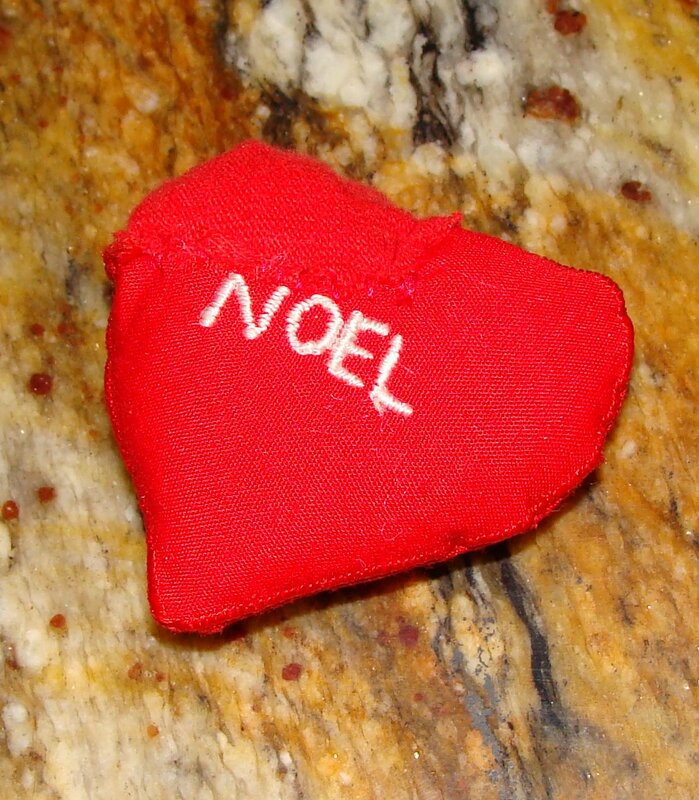 Luckily the ornaments were in fairly good shape, although the Noel heart at the bottom of this photo had been chewed upon and one of the others, a striped candy cane, had disappeared completely. 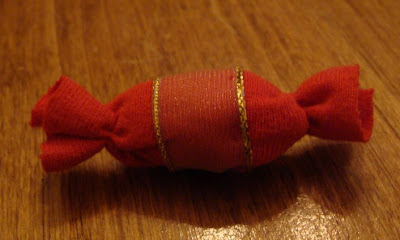 Spookily, the candy cane was one of only two ornaments that represented something edible. This mouse was clearly smarter than the average rodent. I was loth to throw the whole thing away and it did look as though it might be salvageable. There's me trying to lead a more self-sufficient and sustainable lifestyle, I thought. I should be able to do this, just on principle! 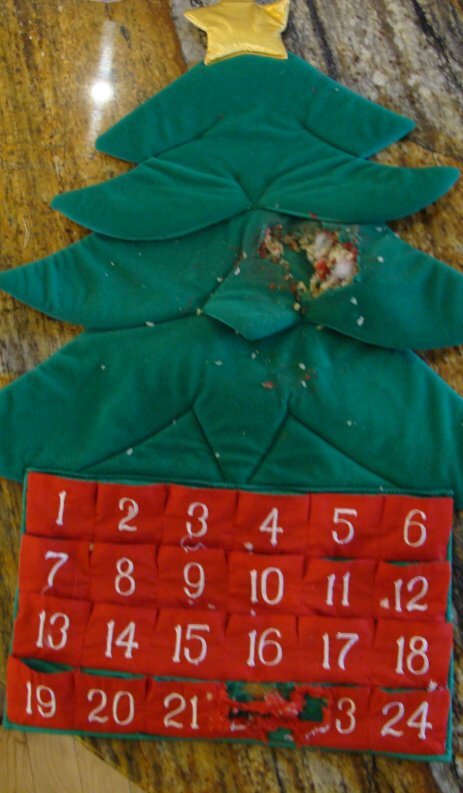 I'm hoping that my amateurish repairs will become a new part of this particular Christmas tradition: "Do you remember the year when a mouse ate our Christmas tree?". Nice job taking a risk and repairing your advent calendar. I'd like to get one like that someday soon.